Soon, he will get his Ph.D. at the University of Nijmegen on the subject of chemometrics. He enjoys working with Linux and writes down his experiences on a regular basis. This articles shows how to record music with Linux. In contradiction to the LinuxFocus tip of January 2001, not the 'expensive' WAV-format is used. Instead, the much smaller mp3-format is directly recorded. 24 hour recordings in CD-quality become reality when using this format. First, record a wave-file with a recording-program. Use an mp3-encoder (e.g. 'Lame') to convert the wave-file to an mp3-file. Recording a wave-file quickly takes up quite a lot of disk space (100 MB for 10 minutes of stereo music in CD-quality). This restricts the storage capacity for music recorded in this format. An mp3-encoder is capable of converting the wave-file of 100 MB to 10 MB in the standard mp3-quality (128 kbps, stereo). This property enables the digital recording of music for 24 hours, without any interruption! 24 hours is 60*24 = 1440 minutes, using only 1,4 GB (1440 MB) hard disk space!!! I have used this feature to record the eighties top 300, transmitted by Loostad radio (some English pages are also available). The recording was interrupted just once, the mp3-recording program stops automatically after 24 hours and this was not documentated..., the recording was very good! I will show you what software I used and explain alternative ways to make real-time mp3-recordings. I have as well made the software used for this article available on seperate page (links are further down in the article). With the software program 'mpegrec' (requires the mp3-encoder 'Lame'). With a recording program, e.g. 'sox', where the output is piped to an mp3-encoder ('sox | lame'). 'Mpegrec' does the same as 'sox | lame', but different settings are already defined. The user does not need anything else. Just installl 'Lame'! I advise you to use 'mpegrec'. However, keep in mind that this program stops after 24 hours!!! Furthermore, an annoying casting-bug results in erroneous recording times: the recording time as set by the user is not correctly used. Most of the times, it is quite a lot shorter! Using 'mpegrec' is easy. In an xterm, type 'mpegrec -b 128 -o ./test.mp3' and there you go! -b Use 128 kbps as the mp3 bitrate. The standard value in 'mpegrec' is 192, which is a strange (and much too high) value. Almost all mp3-files have a constant bitrate of 128 kbps. Please take care that your mixer-settings are set correctly. If not, nothing will be recorded! The correct recording-source should be selected and the appropiate volume-controls should be at their highest settings. sox The recording program: sound is recorded using the 'line-in' of the soundcard. -t ossdsp The sound input originates from the OSS sound drivers. These drivers are included with the Linux kernel if the standard sound support is included. -w Sample bit type is 16 bit long word (if you do not understand this: don't bother, it is not important). -s The 'sample data' is 'signed linear' (if you do not understand this: don't bother, it is not important). -r 44100 The sampling frequency is 44100 Hz (CD-quality). -c 2 Record from 2 channels (stereo). /dev/dsp This is the sound-sampling device: the Linux-device that delivers the recording data. All devices, ports, disks, and so on are accessed using the '/dev'-directory. The wave-stream is accessed in linux from '/dev/dsp'. As a matter of fact, it is even possible to get your soundfile using the following command: 'cat /dev/dsp >test.wav' (works only if the mixer-settings are correct!!!). -t raw The output is 'raw' data (unchanged, straight from the soundcard). lame The encoder program: the recorded sound is piped to 'lame' for the mp3 conversion. -x 'Force byte-swapping of input'. I do not know the precise function of this option, but without it the procedure simply does not work (before I found this out!). -m s Encode as stereo mp3-file. Standard, 'lame' encodes it as 'joint-stereo': only the DIFFERENCES between both sound channels are encoded. As a result, a higher compression is obtained, but the mp3-quality is poorer. - Input is 'stdin'. This is correct for the current example. ./test.mp3 The name of the final mp3-file. Figure 1: The standard KDE mixer-settings. Figure 2: selecting the correct recording-source. Off course, 'RecSource' is selected to set the 'line-in' of the soundcard as the recording-source. Use the same procedure to turn the microfone off as a recording-source: you do not want to have the additional noise! If the 'line-in' is not selected as recording-source, no sound is obtained from the 'line-in' (even if you can hear the music yourself)!!! Do not forget to set the 'line-in' on 'unmute'. Figure 2 depicts this correctly: you can set the 'line-in' on mute, so currently it is 'unmuted'. Figure 3: The KDE-mixer is set correctly. XWindows demands a lot of system resources. The same is true for the recording and encoding of sound. In XWindows, this might result in disturbances of the recorded signal. If you use your computer for real-time recording, you might not use your computer for other tasks. If so, you should not run XWindows. You need sound support within the Bash-shell. Sound support is often initialized if XWindows is loaded. You need a mixer that can be operated from within Bash (in text-mode). pre-install sb /sbin/modprobe "-k" "adlib_card"
pre-install sb /sbin/modprobe "-k" "awe_wave"
post-install sb /usr/bin/sfxload "/win98/Program Files/Creative/ctsnd/sfbank/synthgs.sbk"
Your soundcard is always defined in 'alias char-major-14' (if the standard OSS-drivers are used, which is usually the case). This line is closed with 'sb', so I know that the command 'modprobe -k sb' initializes the soundcard services. 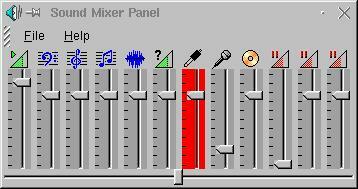 The second problem is selecting the 'line-in' on your soundcard with a text-based mixer-program. I use the 'aumix' program. If in Bash the command 'aumix' is executed, the mixer starts in interactive mode. In this mode, settings can be checked and changed in a glance, see Figure 4. 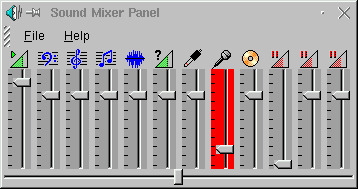 Figure 4: The text-oriented mixer 'aumix'. You can select the different recording sources with the arrow buttons. The '<' or '>' buttons selects the volume (left) or the balance (right). The '+' and '-' buttons increases and decreases the volume of the currently selected source. 'm' mutes or unmutes the current source. If the current source is selected as recording source, a red 'R' is displayed on the left of this volume source. If the source only can be used for playback, a green 'P' is displayed. Pressing 's' saves the current settings in '~/.aumixrc'. These settings are activated very easily on the next startup with the command: 'aumix -l'. mpegrec -b 128 -o "$1"
Sound is initialized, 'line-in' is selected as recording-source, and 'mpegrec' starts immediately with recording. I made the 'mpegrec' software used in this article available for download. More information regarding 'mpegrec' can be found on http://www.netwaysglobal.com/mpegrec/. Only the source-files and the compiled win32 versions can be found here. A page with more information does not exist, but some more information can be found here. The 'lame'-files and installation tips can be found here. copy the file to, e.g., the '/usr/local' directory. type 'make'. The program is compiled. type 'make install'. The program is installed and is immediately available for further use. The 'lame' version used in this article is as well available for download. The 'lame' homepage is on http://www.mp3dev.org/mp3/. copy the tarred and gzipped file in the, e.g., '/usr/local' directory. The lines that do not have a '#' should get one now. You do not need these extra options! type 'make' to compile 'lame'. It is likely that a symbolic link must be created from the /bin-directory to /usr/local/lame-3.70/lame to be able to execute 'lame' everywhere. 'Lame' is ready for execution. 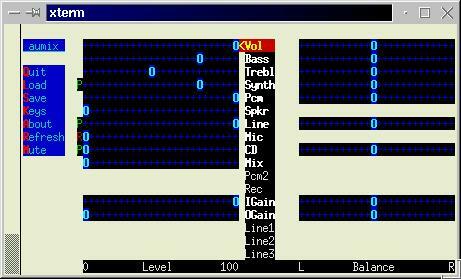 'Sox' is a program to record, convert, or edit sound. As an example, an echo can be added to a sound file. Read the 'sox' man-pages ('man sox') for more information. Conversions that 'sox' can do are: convert a wave-file to an .au-file (the standard SUN audio format) and vice-versa. This possibility is sometimes very handy! The version of 'sox' used for this article can be >found here< and the homepage is at http://home.sprynet.com/~cbagwell/sox.html. copy the tarred and gzipped file to, e.g., the '/usr/local' directory. type './configure'. Several settings are selected and a 'Makefile' is created. This 'Makefile' is specific for your system! type 'make'. This will compile 'sox'. type 'make install' to install 'sox'. 'Sox' is ready for futher use. 'cron' starts a heavy 'find'-process that interferes with the mp3-recording. The standard OSS kernel sound drivers gave problems. The mp3-files contained small pieces of irritating noise (even painfull for the ears). A closer look revealed that the wave-file also included this noise, no matter which wave-recorder was used. Thus, it is no mp3-encoding ('lame') problem. Please check whether 'cron' is needed for other tasks! On a desktop Linux machine, this should not be a problem. This problem was solved by using the alternative Alsa sound drivers. Use the Alsa documentation (not included in the packed driver/utilities files) to obtain instructions on how to install these drivers. It is better not to use these drivers unless real problems do occur.